…a pleasant room with three doors and a lamp. Looking at the picture on the wall they decided it wasn’t a very good likeness. One of them almost fell over something on the floor. “Why don’t they pick up after themselves?” he said, sounding like an old man. “Weren’t you ever irresponsible?” I asked, thinking of my childhood and how wild I had been. Music was being played somewhere nearby. We stopped to listen for a moment. The monk seems to be poring over from being all alone. In regards to the shearing of his tonsure; it looks like he’s wearing those overalls, as if it were a bad habit! Is there any other reason why the topside of his bare head is missing? It’s as though someone had forgotten to dought the I before they crossed the T.
Not sure if others have said this but when it mentions the Guide’s “wild youth” I think it is ironic because the Minotaur’s youth was the only time he was not wild in Greek mythology. (This is of course before he was named the Minotaur and was just asterion) so age 1-3. I don’t know if anyone mentioned this yet, but the Picasso-ish drawing may be of Christopher Manson, the author. The painting is obviously of a man, and the spiky shape in the back can be interpreted as a sun. Man + sun = MANSON. No this has never been mentioned before. SP represents the Maze community’s friendly welcome wagon, Penguin. This is his version of saying hello. He may not realize it sounds aggressive and mean. Believe it or not, SP was speaking true! Maybe it has been mentioned here, who knows, no one is going to read all these comments, but I don’t remember it. We have always taken those things to be stars. There are two of them in the painting, reinforcing this interpretation. Look, that painting is one of the few in this room we have a good explanation for! Highlighted and paired as it is with the Guide’s horned mirror, this painting really jumps out and that’s not an accident. The style is obviously Picasso’s, but is more specifically very similar to faces in the many, many etchings Picasso did that featured the Minotaur. Look especially at Minotauromachy and Blind Minotaur Led by a Little Girl in the Night. The stars are a reference to the Minotaur’s name: Asterion, which means the starry one. Also, Manson himself has said that he put his last name in the book only once on purpose (and did not include his first name at all), and that’s very clearly in Room 19. I’d give my “eyeteeth” to make an argument that cogent! An eye is a zero which means I would give no teeth. The chance of a book including a Picasso-esque picture with stars on it is very low. We’re going to overestimate the number to be conservative, but just look at any books you have around you, most of them don’t have any pictures at all, and ones that do don’t usually have a picture like that in them. So we’ll say the odds are about 10%. We will call this P(B), and say that P(B) = .1. The chance that Christopher Manson would intend a Picasso-esque picture with stars on it as an allusion to the Minotaur is, let’s say, 50/50, since there are only two possibilities. We’ll call this P(A) and say that P(A) = .5. Now, here’s where things get tricky: What are the chances that a puzzle book named MAZE would include a Picasso-esque picture with stars, GIVEN THAT Christopher Manson intended a Picasso-esque picture with stars to be an allusion to the Minotaur? Well, this figure has to be close to 100%, since if Manson intended it then the book is going to contain it, unless there’s a printer error or something. But, just to be EXTREMELY conservative, we’ll say the odds are 99.99% [.9999]. This is P(B|A). Bayes’ Theorem says that if you multiply P(B|A) by P(A), and then divide this product by P(B), you’ll find P(A|B), which in this case we’ll define as the probability that Aria came up with a good solution. .9999 times .5 equals .5 (rounding up), and .5 divided by .1 equals 5. This proves that it is 500% likely (remember, you have to multiply your answer by 100 to put it in percentage terms) that Aria came up with a good solution. So, even though I have regarded this idea with some suspicion in the past, I have to sort of resist my cognitive biases and respect what reason dictates. Good work, everybody! I just ran this mathematical proof by an expert mathematician and philosophy professor just to be sure I wasn’t getting excited for nothing. One of them was so impressed she said I would pass any high-level statistics exam with no further preparation, and the other said that I was qualified to review both of their work. Update: It turns out that that drawing doesn’t really resemble Picasso’s work all that much; thanks for the helpful points of comparison, Aria. If those are the most similar images in Picasso’s catalogue then I think common sense may have to overwhelm a facetious application of Bayes’ Theorem. AGAIN. It’s just a childishly bad drawing, like the house in 15, not a Picasso. If you want to make a generic Picasso face, you put both eyes on the same side of the face or something. Or maybe it is a Picasso, who knows, I don’t, but it certainly doesn’t look particularly like anything in those minotaur paintings. GAH, why can’t we post images in here!!!??? You just need to use your EYES, vewatkin. Thanks for welcoming me to the community! I never heard about the fact that he only hid his last name once, so thanks for that. I was wondering, if the painting is not a Picasso and is not of Manson, does anyone have any ideas as to who it could be? Or is it just another red herring? I myself support Aria’s theory that the face could be related to the Guide, which also fits with the “not a good likeness” comparison of before. Since the painting has the Asterion connection but not the bull, it would make sense. It’s related to a puzzle involving people with only one of their eyes showing in their portrait. top right: Plutarch? Gandalf? Who knows. SP’s comment about the black and white squares stuck with me. It been a couple years since I tried to solve a puzzle in MAZE but I gave it a go and perhaps made some progress. Alas I have no time to follow up on what I have found so far and so I am just putting it out there for others to follow up on, or not, to see if there is gold in the hills or just pyrite. Perhaps the most famous book in chess history is “Liber de moribus hominum et officiis nobilium sive super ludo scacchorum” written by a monk by the name of Jacobus de Cessolis. It describes the chess pieces in terms of moral allegory. It was a very popular book and was translated many times. An Old English translation by William Caxton was the second (or a long time scholars thought it was the first) book every published in England. It’s popularity surpassed the original and (like the original) was read by people of every social strata, commoner to royalty. In this image Cessolis is holding up a chess piece which (based on size the piece) is either the king or the queen. I haven’t read the whole thing and don’t have time right now and if no one picks this up I’ll get back to this eventually, but so far I see nothing to indicate that we should choose the king over the queen and take door 33. Perhaps if there is a solution here it is something different like a reason to move the queen to the king. So here in Room 7 we have a picture of a monk with a placid (humble?) look on his face on a chessboard-like-floor, in a room with a crown (king) and queen-like lamp capital. – And it turns out there is a monk who wrote a famous boo which describes the moral character of the pieces starting with the king and queen. And in an even more widely read translation of the work there is a woodcut of the monk in a room with a chessboard-like-floor holding up either a king or a queen. Is there a solution here somewhere or is this just a mess of coincidence? I learned that I absolutely cannot read old english – ugh! I had to read olde english back in high school for a project or two. With the recent development of the F HOUR TREE trumping all the crazy complicated numerology, ‘maze time’, and all that other jazz, this seems like a complicated route. Factitious mentioned in the Mazechat that if Manson had intended for this character to be a bishop or other higher up religious type, he probably would have drawn it that way, which puts my theory on shaky ground, where it should be. Although there is a guy with a crown and a queen-looking pawn on top of the lamp, I don’t know if these are enough of an indicator to say ‘ok, this is certainly a chess room”. I agree with your skeptical stance – the crown, lamp and floor are not enough to make this the chess room. If I had not come across the woodcut of a monk on a chessboard-like-floor I wouldn’t have mentioned it. So far there is no solution to critique. Just a woodcut of a famous chess loving monk on a chessboard floor, and his book. As I see it, the first step is to see if there is a solution here which is straight forward enough to be potentially convincing…there may not be. There is a theme through the book in regards to the queen sticking around to protect the king and be with him. …it is a strange book. So according to the book by the monk which has a picture of the monk in a room with a chessboard floor, the queen should stay with the king – and in this room which has a picture of a monk in a room with a chessboard floor, the queen is next to the wrong doors and the king is next to the correct door. I have not convinced myself but I figured since I originally tossed this possible solution out there I should share what I found. Spent 10 mins on this and thought I can see why you tried to pawn it off (pun!). But came back to it today, it is really a facinating little book. Fun and nutty that this was super popular once. Take it for what it’s worth, but I believe this room is not fully solved because of the issue of the checkerboard under the monk. I would say that this is simply an analogy to a bishop (which moves diagonally) and since the monk is facing the correct door, we can gather that this is the meaning of it. Not groundbreaking, but it seems to work in the context of the portrait. ^^ I realise this was posted already, my post is really about justification as to why, rather that what. You could be right about the checkerboard floor. It is unusual decoration. It was mentioned in the Mazechat that bishops and monks traditionally hated each other, being opposite ends of the indulgence spectrum. . The presence of a man with a crown along with a strangely queen-like looking piece on the top of the lamp does give this room more than one chess related item, loosely. The monk could be a pawn. It is a stretch but monks a pretty powerless and his head is really round like a pawn. Oh yeah and they capture stuff diagonally. Please do not ask Manson about wool, I think I figured it out. Whether the object is wool or a carpet, or rug, the same idiom is associated with it, that is, “pulling the carpet from under you” or “pulling the wool from your eyes”. Combined with the pull-toy , which is facing the correct door, this could make for a good solution. Even without the pull toy, pulling the carpet/wool itself would be in the opposite direction from the doorway its in, to the direction of the correct door. Idioms and directions, from the past little while, seems to be something Mansonesque, I think this fits well. We also have the case of the lamp plug that could be easily pulled from the wall (again, in the correct direction). Another allusions to pull the pull-string toward the right door. Congratulations on finding “pulling the rug out…” ! As far as I know this room is done! I am bumping the solve meter up to 5/5! > “pulling the wool over (his/her/their) eyes” < Yes the room has eyes, a pull toy and some are covered - but if Manson had meant to allude to "pulling the wool over ___ eyes" he could easily have done so. Here as some possibilities: A tag that says "100%." Adding a sheep to the picture with the clouds. Adding a portrait of Jason with the fleece over a branch. Getting the rug up off of the floor so that pulling it would bring it down instead of sliding it across the floor. Etc. As it is now the only way to know if it is wool would be to ask Manson since it could be anything fuzzy. On the other hand, any fabric laying on the floor can be considered a rug. A bit more evidence for this solution is the unusual way the rug is rumpled. There are two upward curves, one for each hand, as if inviting someone to pull the rug. If the person were to go through this door they would have to walk on the rug. If the rug was grasped by the two upward curves and pulled in the direction of the pull toy while someone were taking this door, the results would be a literal playing out of the idiom. Congratulations also to Aria for pulling the plug! And again to sp for putting this together with the rug pulling solution! Those things flanking the doors sure do look like lowercase “i”s (eyes?). There are two of them on each wall, just as there are two single-eyed people on each wall. 1 1 + 1 1 + 1 1 = 33. That stuff coming out of the door to 16 is wool. Pull toy, wool, pulling wool, pull wool over one’s eyes, room’s solutions revolves around hidden eyes, etc. That’s the way I see it, anyway. Sara sees three things that can be pulled: the plug, the pull toy, the wool. I see the reference to pulling wool [over someone's eyes] to be the key thing here that makes this meaningful, but write your local congressman and tell them what you think. If it is about pulling, maybe there’s some kind of contrast with the push-pins in the poster by 16? Or maybe not! BLAH BLAH BLAH. I don’t even think those are pushpins. They look like nails. Anyway, instead you pull the pull toy towards 33, which looks like fun, as Factitious pointed out. Nothing bad about that. Also the string makes a smile. Maybe it’s just another general statement thing: “pull back” meaning retreat. I feel like you are working hard to make this worse! Imagine you were just given a phrase like “pull the wool” in this room. That seems rationally calculated to get you to complete the idiom and think about covered eyes. Covered, concealed–not the same thing, and most of these eyes are not exactly covered by anything except the panel border or the other half of someone’s face. NEVERTHELESS look let’s be serious it’s about as on target as most of things we’ve seen in here. Maybe someone already said this, but it’s occurring to me as if for the first time: the Picassoey drawing on the left would be a bit more Picassoey if it were a bit more cubisty, in particular if it had both eyes visible on one side of the face, as is sort of the trademark aspect of a cubist face. The art style may be intended to draw attention to the missing eye. Just to be clear, though, I am 100% on board with “pull the wool over your eyes” as an expression that is being referenced here in order to help you see the hidden-eye solution. No disrespect to WR or Hello Gregor, but I’m confused as to why “monk looks at door 33″ is enough for a solution. Is it because his checkered floor connects to Room 41, the room that gets you out of the loop? Do we just trust him because he’s a monk? It is not a very strong solution but the reasoning is simply that his whole body is shown including the floor, and he is aimed at the correct door. The only other fully rendered person is sitting, and his lower half is covered by the lamp shade. This comparison of figures (aimed at door as if to walk vs sitting and reading) seems intentional. Plus the guy is a monk suggesting that he is trustworthy. Taken together this is suggestive of a solution but hardly definitive. The horns over the mirror could be another 3 on its side. And the reflection (assuming that IS a mirror) gives you the other 3. The rug….pfffffft……as much of a figure 8 as the dragon in 18, I guess. Congratulations on the ribbons! Putting it on the board. Hail gentle viewers, we have a new episode of Mazecast available for viewing at mazecast dot com. We talk briefly about the room and a bit more about the Guide. As I am looking at dual personality people I see the following here: The 2 only full body portraits can be combined as the man with the long beard/robe/book(bible) superimposed onto the monk combine to make Gregori Rasputin, the Mad Monk: Cow horns are just a clue to the “COWL” necked monk’s robe when pulled up over the head forms a hood-narrative-“childhood”. Rasputin was born a peasant – narrative “pleasant” clue. He was known for his excessive long beard as we see in the portrait and for wearing a “fur” coat as we see on the floor in the doorway. The music mentioned could be vocal music as in monk’s chants. The person that tripped over something on the floor, complained sounding “like an old man” as in grumpy and mad=Mad Monk. The “blank” portrait would be that of “The Invisible Man”. It looks like we have another dual/person visiting MAZE-Gregori Rasputin, The Mad Monk. -I noticed that the pull string on the toy duck is missing from that little guy in Room #39. I agree with all the 3 eye counting including superimposing the 2 portraits that would be combining 2 eyes + 1 eye = 3 eyes. -Cow horns are prepared by “taxidermists”… taxidermy & fur coat here is also in Room #42 as narrative mentions “taxidermy” and has a full bear (bear fur coat). Read “House of Asterion/Borges last night-very Poe like-plan on finishing my Poe rereads and then I’ll read more Borges but not at night. The horned picture has generally been referred to as a mirror, but there is no reflection on it. Could it simply be that the picture has been removed? I suspect it’s like the torn picture in 9 and the torn warning in 6, an obscured indicator of the Guide’s identity. I guess you can see where that’s going. It’s worth reading, maze people. On a side note, White Raven’s maze mythology section describes the labyrinth as being the minotaur’s house, not a prison, but this is not the traditional mythological conception. 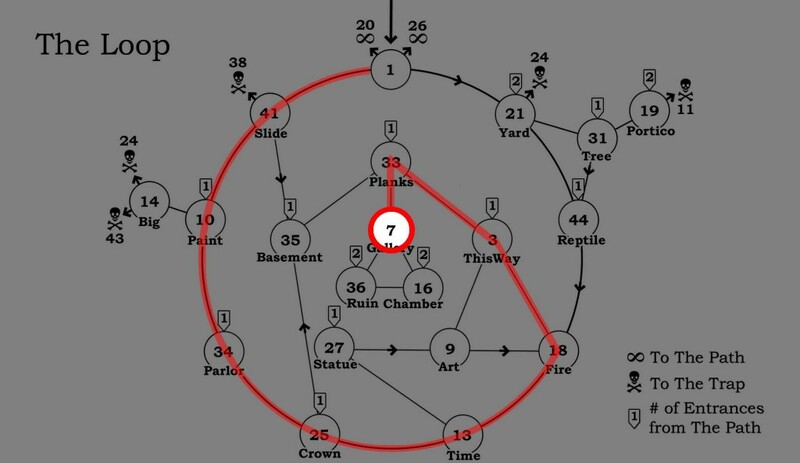 I could obviously be missing something, but I’m not aware of any source before Borges that described the minotaur as free to walk outside the labyrinth but choosing to stay inside it. Regarding mirror – it is a lot less shaded than the wall it is on – so I’m still going with mirror there. Oh, I didn’t get what you meant about the shading at first. I agree, what we see in the frame, if it were not a mirror, would have to be some kind of backing, not the bare wall, which is much darker. I have certainly always thought of it as a mirror too, and the simple fact that we all see it as that is good reason to suppose that’s what it’s intended to be. But I don’t know WHY. Mirrors reflect, and this doesn’t, it’s not at an appropriate angle to be reflecting the floor at us, and it’s not like it’s just whitened by glare (the bottom of the mirror is shadowed). I suppose the best answer is that it’s just a stylized image of a mirror to avoid the difficulty of figuring out what reflection should go there–but doesn’t that seem like it would have been Manson’s kind of thing? There are a lot of blank things in the Maze, from the die in 37 to the unpainted sign in 10. I suspect this is just like those, but, as I say, there is some reason to think otherwise, even if it’s hard to articulate. I read Borges when I was younger, “The Library of Babel” is one of my favorite short stories. Thanks for the heads up on “House of Asterion” I haven’t read it. Regarding “White Raven’s maze mythology section describes the labyrinth as being the minotaur’s house, not a prison, but this is not the traditional mythological conception.” It is so, yah big fibber! … Okay I suppose it depends on how you look at it. When the minotaur was born why didn’t the king just kill the horrible thing? Out of respect for his wife. So why not just toss the thing in a pit? Again out of respect for the wife a maze is built so the creature can live and roam and hunt. So yeah, it is a prison meant to keep the thing from depopulating the countryside but it is also a home, built with great effort to create a hunting ground to please the creature. Gotta keep the wife happy. What does it mean that the pull toy in the center of the room (perhaps not there when they leave “Leaving the pictures looking out at an empty room..” ) is on the shelf in 39? I think they are supposed to pick up the pull toy and look in the mirror, (and then probably take it with them) – the details of what that does to the eye count on the walls, etc… can be found on my page. Mr. Gentile, thanks for your response. I would be interested in your take on my recent remark on page 1. 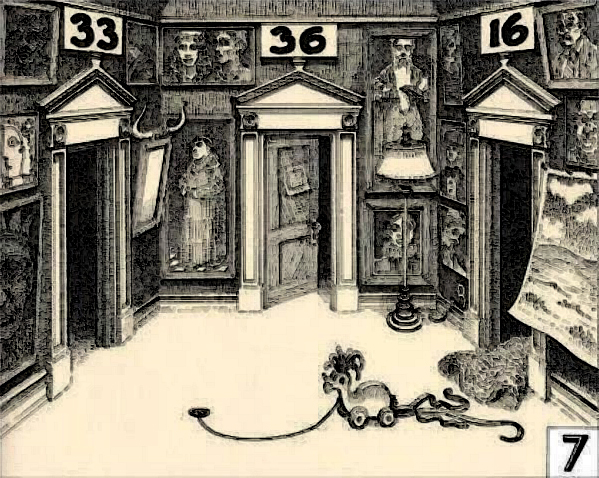 I am interested in the difference between clues from the narrator, which by and large appear to be reliable when reversed, and occasional, improvised clues, an umbrella pointing at the right door, a mallet left pointing at the right door(s), a rake left pointing at the right door, a note warning against the guide. These appear to be reliable un-reversed. Is that a trappist monk? TRAPpist. I hope this comment isn’t abyssmal. If key word for room 9 is sight and if we include the monk then for the “riddle of the lamp” we have: “sight of true death and rebirth will strike man” And then we turn on the light to get a lightbulb over our head and look in the mirror while holding the pull toy.